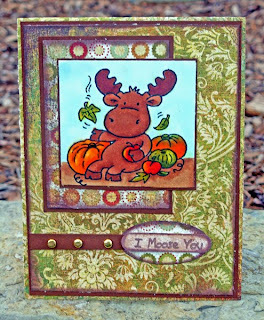 Friday's are fun over in the Hanna Stamps Member forum on Splitcoaststampers. Each Friday, one of the Design Team members host's a challenge. Today was my day to host. I decided that this week, a 3D Challenge might be fun. To make this project, I purchased an inexpensive jar at the dollar store. I cut a couple of thin strips of imaginisce paper and wrapped them around the top and bottom lip and used SU's new Halloween rub ons on the lip of the lid. I took the sweet pumpkin image from the Hanna Trick or Treat set to create the focal point of the jar. Using more SU Rubon's I added the saucy little pumpkins to compliment the bigger image. I wrapped the tag around the jar with black grosgrain ribbon. As you know, I have been spending the last week with some very very very good friends. I was blessed to spend last weekend with Jacqui............... I didn't get around to taking any pictures, but I'll be seeing her tomorrow and hope to get a few. Jacqui had a little stamp fest with all my best girls............Tammy, Kim and two new friends, Lori and Donna. Lots and Lots of Fun. I arrived at Kristi's (AHHHHHHHH) on Tuesday and think that I could just stay forever. We are having so much fun and like Jacqui, I SO wish that Kristi lived closer to me. Here we are before we went out to dinner last night. Tomorrow, we'll be leaving and I am so happy we got to spend time together, but said that it flew by so quickly. I had the chance to stamp of course and am looking forward to sharing some new creations with you. Remember, we are having a new release this week. Don't forget to watch the Design Team Websites all this week for some AMAZING sneak peeks!!!! School is approaching and fast!!!!! Can you believe that the summer is almost over??? It seems that it just flew by. With the excitement of CHA and having a relaxing week at a cottage, celebrating Jonathon's Birthday and Cutting the jungle of a lawn, summer was busy busy busy!!! I am looking forward to enjoying next week, a little road trip with Jon to visit my best friends Jacqui and Kristi. Just spending down time with good friends is the best!!!!! I just love this Teacher image. 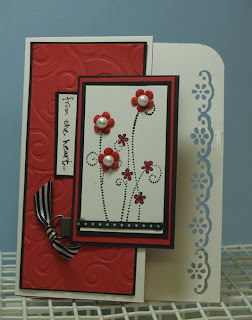 I created this card as a pocket card..........I can't recall the name of the DP, but I just had to have it when I saw the rich rich colours!!!!! The image is from the Hanna Teacher set, which was released in early August. So many sweet images!!!!!! Just love her Glasses and sweet face!!!!!!! I'll probably be scarce for the next few days!!! Enjoying the last days of summer with the people I love the most!!!!! Niki Estes who designed this very cool sketch for us in addition to making the card Halloween Themed. This was a fun card to make. I had to do some thinking in regard to how I would fit all of these characters onto one card, especially with the row of houses behind. So, I made one HUGE card! Yep, just folded the sheet of 8.5 x 11 paper in half and went to town!!!! lol. I used the neighbourhood wheel from stampin' up! to create the background and then of course added all the sweet Rileys in, using the masking technique......the Sidewalks were hand drawn and all colouring was done with Copic Markers............. did I mention how much I love them??? Don't you love this sweet little Riley. I used Copic Markers to colour the image and Basic Grey Paper for the Backgrounds. "I moose you" comes from the Riley Sayings set. There are so many cute little sayings in this set. You can see it over on the Hanna Website. I have noticed many sweet samples from fellow DT members online this week. Take some time to follow the links on my sidebar!!!!!! 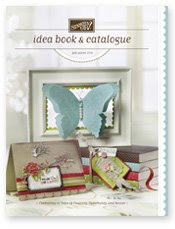 There's a New Idea Book and Catalogue !!!! And I have to say it is Just Beautiful. SU! just keeps coming up with more and more gorgeous samples and accessories. With September creeping up quickly, I am hastily working on Projects for my fall/winter line up of classes. I have already ordered some beautiful accessories to work with. You will see a the beautiful new products, the great recruiting specials and fall promotions. Join me soon for my New Catalogue Open House. I should have a date for you very very soon. I am SO excited that Simply Said remains in this years' idea book. It is such a sweet and versatile set. Happy Wednesday!!!!!! Nice to be getting closer to the weekend eh??? The chill is in the air--Argh! And I mean CHILL..................brrrr.......... the temperature over the last two days has dipped drastically to the point of reading at between 15 and 17 degrees celcius....... that is under 70 degrees! Pretty darn Cold for August eh??? I am positive that we will get some warm weather soon, but this cold spell has me greatly anticipating "sweater weather". Yep, Sweater Weather is what I refer to as Autumn, my favourite time of the year. So really for me, the Argh becomes a Wahoooooo!!!! Why sweater weather? Well of course it's because I can finally comfortably don my favourite sweaters, which happen to be my clothing article of preference. From Cable knit to turtleneck, big chunky knit sweaters are as comforting as chocolate and green tea!!!! Gee, maybe I can get away with slipping into one today. While at Chicago CHA, I was very fortunate to participate in the COPICS Certification class. One of the very cool techniques, that Marianne taught was feathering. See the smooth transition of the blend of colour on the sweet Pirate's Parrot??? That is Feathering. I could write you a great tutorial (well, reasonably good at the least!) on how to do this, but I will give you something even better!!!! a Direct Link to Marianne's Blog............... I LIKE MARKERS Wow, almost every day, there is a great tutorial on the various techniques and tips for using copics! Why recreate the wheel when there is an expert at hand. 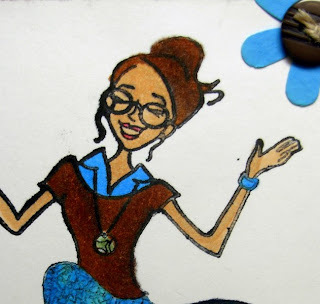 Check out her Beautiful Illustrations as well, she is an amazing artist. Sweet Riley Swashbukler was coloured in that very class, using a variety of Copic Markers. I was SO pleased with the depth of colour I was able to acheive after learning proper application of the markers. 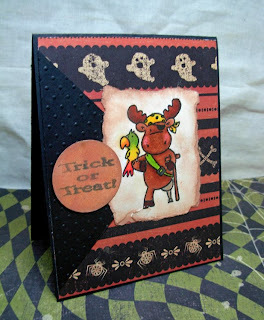 Rusty Pickle Designer Paper, Cuttle bug embossing Templates and a sentiment from the Hanna Stamps Trick or Treat set, help to complete the look of this more sweet than spooky card. To those of you who commented on my angel post, sent private messages or thoughts and prayers my way, I thank you so much for giving me strength on a difficult day. Today was the day I learned that I had an angel of my own. 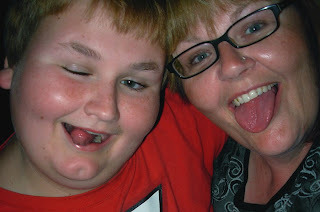 Tomorrow, you would be thirteen years old-a teenager. As I held you, for what seemed just a fleeting moment and as my heart was breaking and the tears were flowing, I couldn't understand why you had to leave. Perhaps God had a bigger plan for you, it is probable that you wouldn't have survived your delivery but still, life seemed so unfair. A beautiful boy, almost 13 lbs and 24 inches long, with rosebud lips and a strong brow, you looked so strong. Life is precious. Sounds like a cliche, but you were my teacher. A lot of things I took for granted became much more significant after you. Working my way through the pain, emptiness and grief allowed me to become a stronger person. I feel that you were and have been with me all the way along this journey. I feel blessed to have had experienced the joy and excitement with each stage of growing you......from the gentle flutters that I felt in your fourth month to the little feet protruding just below my ribcage. The anticipation of holding and loving you and the thrill of being a mother. In the blink of an eye, you have become almost as tall as me, exactly a half inch shorter to be precise. In the blink of an eye, you have grown from a sweet little toddler into a young man who has developed his own unique sense of humour, in which I see some of myself imported. I just wonder how we got to yesterday so quickly. One more year and you will be a teenager, when it seems that just a year ago I was scaring the monsters out of your closet with a can of Monster repellent (airwick actually!) and you still believed I had eyes in the back of my head!!!! Now some days when you give me the "look", I truly believe you think I have two heads!!!!! I'd like to hope, that in addition to inheriting my silly nature, that I have had some influence into the good attributes that you have developed as you grow. Your thoughtfulness and impeccable manners, your ability to be comfortable with who you are and your sensitive and sweet nature. I fell in love with that sweet baby from the first moment that I set eyes on him, just because he was mine. Today I love him more and more for each and every moment and memory that has imprinted on the path to who he has and will become. I made this card for Jonathon. Funny thing is, he loves to give me hints and tips to improve my card making. He happened to be in the room when I was colouring Riley and actually sketched out how his Jersey should look, based on his Football Team Colours. 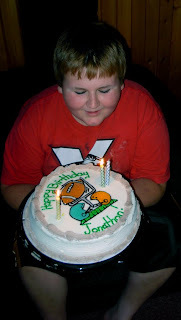 Just being shy of 5'10" tall at the age of 12, Football is a perfect sport for him! I used Copics to colour in RIley, along with a white gell pen to do the stripes on his Jersey. The Leather looking Paper is from Prism and feels like a Pigskin Football. The Initials are Tim Holtz Grunge board that has been sponged with a gradation of various colours from SU's craft ink. Faux Stitching and a little stamping on the "H" with the happy stamp from everyday flexible phrases, a rub on and a football brad complete the look. 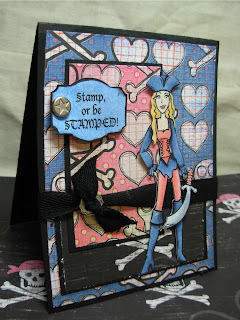 The Fabulous Layout comes from Hanna Stamps Designer Amanda Sewell and will be posted HERE a little later today. Happy Friday!!!! I can't believe that the summer is almost over. In the blink of an eye it seems. There has been so much to see and so much to do, that stamping really has taken a backseat. With the fall quickly approaching and with the design and teaching commitments that I have, I must get myself out of lazy mode and get cracking! Looking at this photograph, just makes me feel so relaxed and lazy............... this was taken at Bob's lake, the beautiful spot where we have rented a cottage for the last three years. 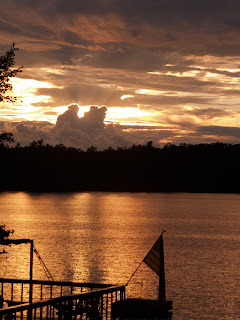 Although the weather was poor in the daytime, we seemed to be able to enjoy some beautiful sunsets. So serene and peaceful. This was my solace after spending a busy few days at CHA in Chicago. I just managed to get all my pictures downloaded today, so I will post some a little later. 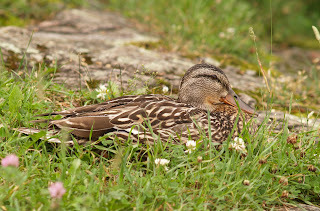 This Mama duck was enjoying a rest on the shore. 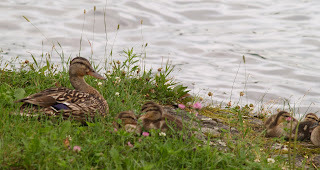 It had been raining quite hard a few minutes before, so she had scooted her wee ducklings out of the water to the safety of the shore. As the sun came out, she was able to relax and watch over her brood from a wee bit of a distance. I must say that although the weather did not hold up all that well, just being away from the rat race of my normally chaotic life was quite refreshing. Although at times I missed my internet, it was just really nice to enjoy the solitude of watching the clouds drift by, roasting the perfect marshmallow to a crisp golden brown over the campfire and spending quality time with Jon. Well, back to the real world. 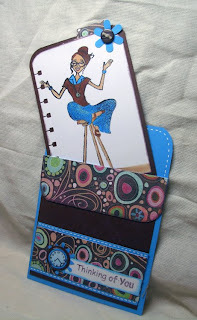 I created this card for a Sketch Challenge hosted by Frances aka StampOwl at the Hanna Release Party last Friday night. Isn't she one Sweet Pirate?? Think she might give Captain Jack Sparrow a run for his money!!!!!!! 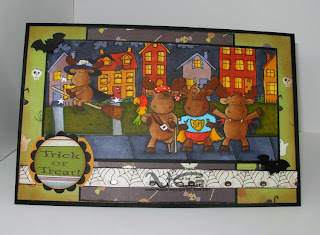 Kristi has four new sets that released........head on over to Hanna Stamps and Check them out!!!! !